Now a day’s Email is a becoming a part of life. It play’s very important role in our professional life. Even it’s a very easy to connect with world because it will take two minutes to send your message to someone. These email services are more secure and privacy from unauthorized users. It convenience everyone in the world such as like Employees, students, business clients everyone they can chat or check their daily conversation with their respect boss. The most important and necessary thing is you need to register on their particular website other wise you cannot access. If you have a good internet connection facility then it will take two minutes to send your message or files. 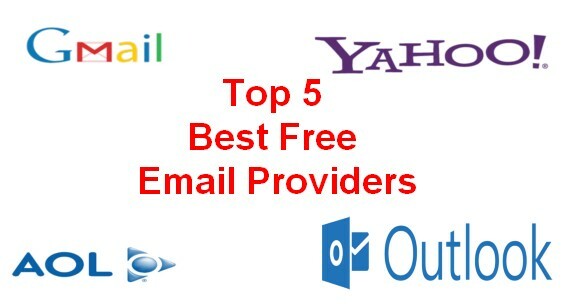 Here i am giving full information about best free email providers like Gmail. We all know about that the best free email provider is Gmail. But we also need to look for other alternatives to Gmail. So here i am listing some top Gmail Alternative email service providers. Yahoo is a free, advertising email service provided by yahoo company. Without any tensions users can access web mail in a secure manner. You need to register on their website and without registration you can not use this email service. It’s support the world wide 27 different languages. There are 281 million people are using this service. In the world it has ranked third biggest email service provider. Basically it has divided into two configurations one is business and other one is free. It has designed in a secure manner. The storage capacity is unlimited. Outlook is the first web mail where it was started to providing email service. Outlook is one of the best email service provider. It’s available on free web mail service owner by Microsoft. As previously we know as like Hotmail, MSN mail and windows live. If you want to access on outlook then registration is required. There are 106 languages support the this process. In the world there are 420 million people are using this service. It has a best features like Skype, office online, one drive, calendar, unlimited storage and ajax. This service is more secure and privacy. America online (AOL) mail is a free web based email service run by AOL company. As we known it was previously called as AIM service and AIM is derived as AOL instant messaging service. Registration is required for users. It’s available on 54 languages in the world wide. The key features will be like unlimited storage capacity, you can attache files up to 25 MB, there is a spell checking option, it’s supported the protocols like POP3, SMTP and IMAP. spam protection and virus protection. MobileMe also called as like .mac and i tools. It is a free email services and owner by apple company. It support’s all operating systems such as like Mac osx, Microsoft windows, IOS and web based. It has changed by so many names. The storage capacity is up to 5 GB and file attachment size will be 25 MB. Even you can share images, videos, audio, files, exchange messages everything you can do. It ‘s support the email protocols like POP3, SMPT and MIME. The key features like Ad free facility, timeless design and best performance. These are the best free email services in the world. You can use in a simple manner. It’s not big thing. By using these emails you can connect anyone in the world. Better way to connect with friends, family member and professional talks. Even these services are available freely so what you thinking just start using these free.